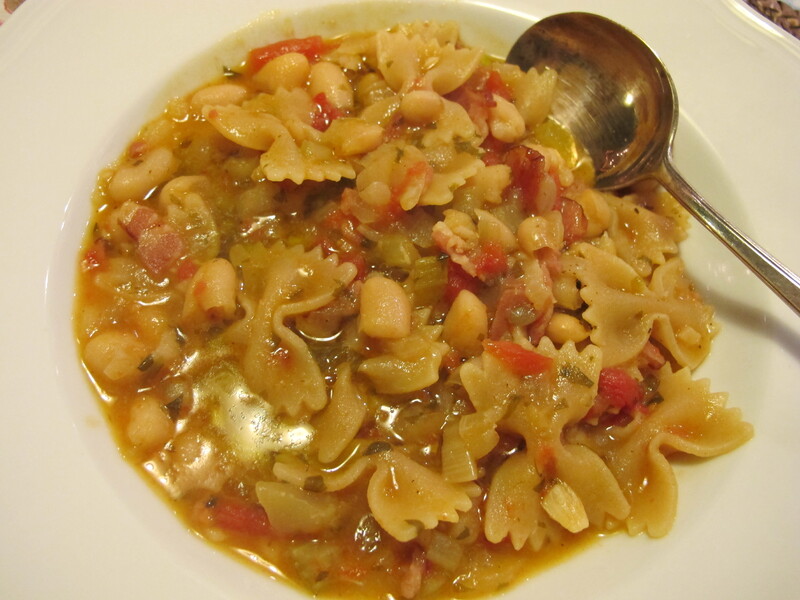 Another bean soup–can’t have too many in my opinion! Interior insulation for the post prandial walk on a chilly winter day. This satisfying soup is based on one in Elizabeth Romer’s lovely book, The Tuscan Year: Life and Food in an Italian Family. 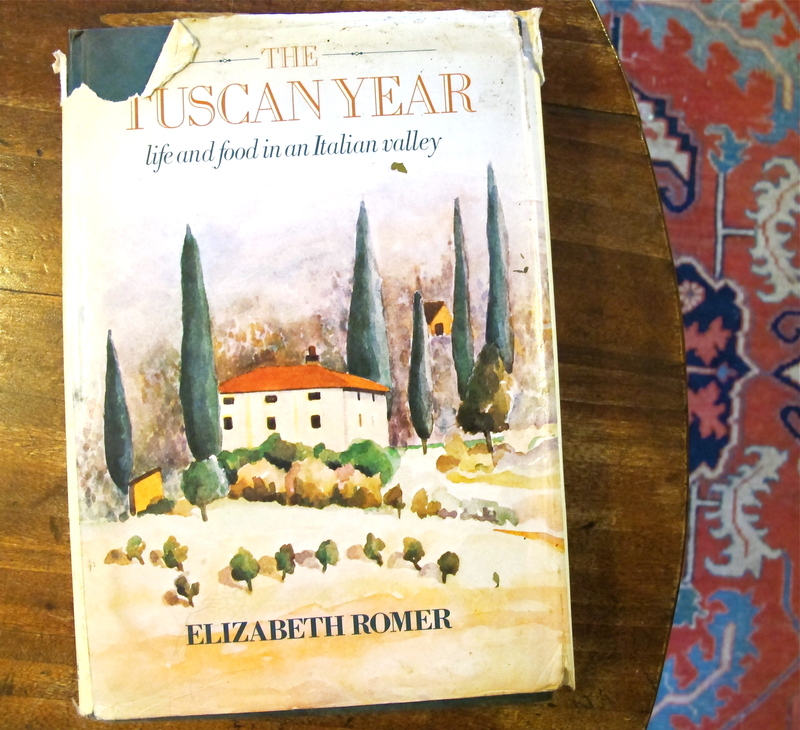 Her account of the Cerroti family’s daily existence is a good read and full of authentic seasonal recipes. 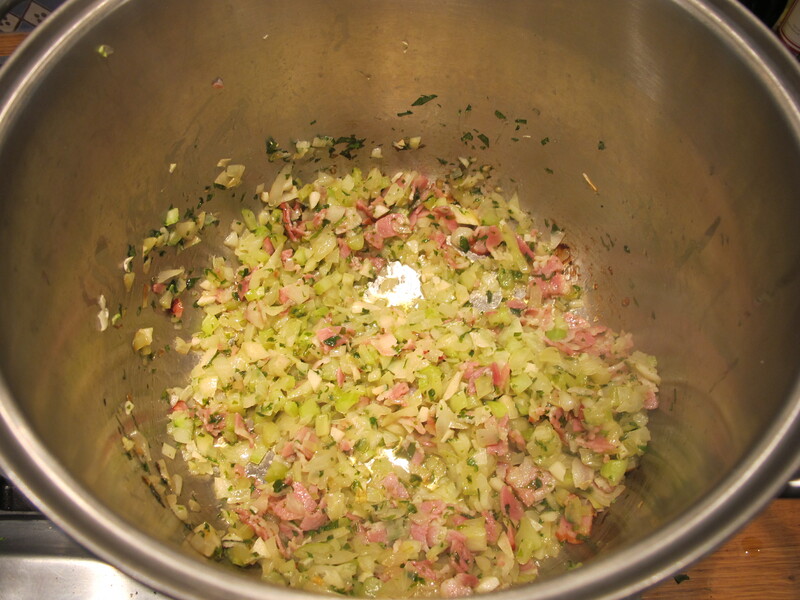 Add the onions, celery, garlic, bacon and parsley, and turn them in the oil. Cook them over a gentle heat until the vegetables are tender and the bacon is colouring up – this is the “taste engine” of the soup and needs some time – at least 20 minutes. 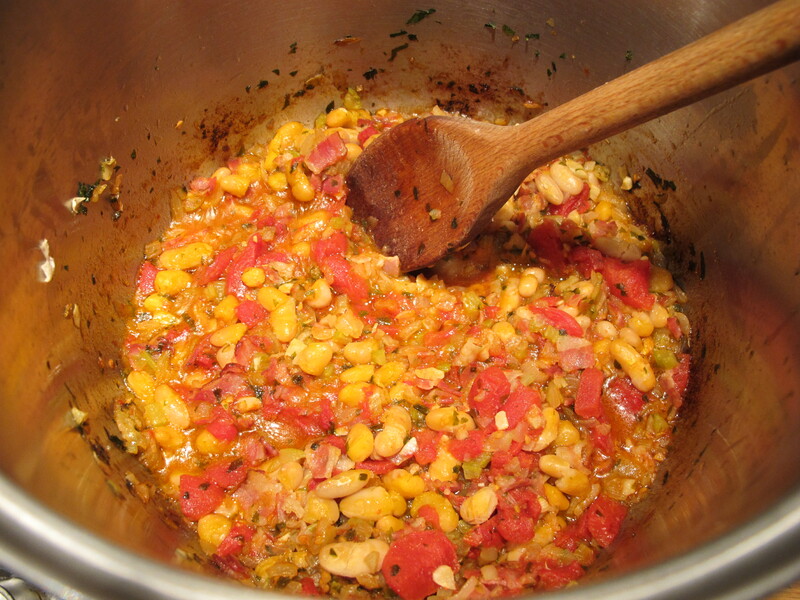 Add the tomatoes and mix them in and allow to meld for a good 10 minutes. Add the beans and mix in. Cook gently for 10 minutes. These stages are important for a good depth of flavour and shouldn’t be rushed. The soup should look beautiful now – with a warm glow. Add half the stock and let it meld in. Add the pasta and the rest of the stock and cook the pasta in the soup. It may take a little longer than pasta normally does (I put a lid on at this point to help). Be careful that this thick and unctuous soup does not stick and burn. If you prefer it looser, add more stock and cook on a little to incorporate it. Check the seasoning, adding salt and pepper to taste –remembering that the bacon and stock can be salty. Serve with grated Parmesan cheese and swirls of olive oil. I’ve owned that book for years, not only for the recipes but also for her style of writing. Your soup looks good, mine started off with ham stock, carrots, onions, garlic and potato but I have since added red lentils and Canellini beans. It should last until Sunday. “Lasting ’til Sunday” and tasting better every day! It does, especially when you add in a few aromatics. Robin you have done it again, this looks so tasty and warming, it has been awful here these last few days, gales,rain and more rain. This I think is just the pick-me up needed.Thank you. I hope Meredith is feeling better now,and able to enjoy this lovely dish with you. I am new to your blog, Robin. I found it by accident after checking up on you after my wife gave me Poldark 2 for Christmas. I thoroughly enjoyed that series. But that is beside the point. I tried this recipe last night, and I have to tell you it was absolutely delicious! We both loved it! And that wonderful scent was still lingering in the kitchen and dining area when I awoke this morning. Cheers! Great to hear it worked!–thanks. Robin I would just like to send you birthday greetings from all of us.Hope you have a wonderful day and that the year is full of happiness and love.-God Bless Elaine & family. Hi Robin, I’ve been lurking for on this blog since I discovered it a few months ago. I also am in France – near Lyon (and was English), and am diabetic looking to reduce the ‘cachets’ consumption. You’re now 70 – well done making it this far, and having chosen such a serene way to live – and I’m 7 years behind. Just retired. I really am enjoying your blog, and make things from it from time to time. In fact I made the last bean soup you wrote about a few weeks ago. A GREAT bunch of flavours. Now I’ve read this one – which I shall also get down to doing soon – I might even splurge on the Tuscany book. I hope you won’t find me too pernickety on this. You say say the beans should be puréed, but in the photo, they seem to have escaped whole. It’s not very important. The reason I noticed it is that my “Meredith” isn’t too partial to beans, so if I purée them ils passent mieux. Never saw the Poldark series, as I left England in 1970. So all I know about you is from this blog. Liked the few Winston Graham books I read a long, long time ago. He had a saying that has always stuck with me: “French women dress as if though they are beautiful”. I forget what he said about the English ladies. Hope you enjoyed you birthday. Thanks for pointing this out, Chris. Fact is I forgot to puré them! It gives the soup a nice consistency and normally I would do it. Whether they are more digestible that way is seriously in doubt I would say! I think dear Winston was right about French women’s attitude to clothes. Thanks for your good wishes–I had a lovely day yesterday. Thank you for the constant supply of good healthy recipes. http://www.bbc.co.uk/news/health-16691754 (although not carte blanche to over-indulge on fried food). yes and apologies for not replying. I did some research too and it is a myth that you shouldn’t overheat olive oil. thank you for the link and your last point is well taken.